There are only a few days left before the beginning of the SWIM-to-WIN competitions and... 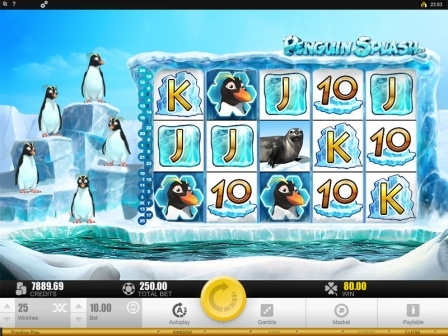 The whole gambling Antarctica is in a flap! Gee! 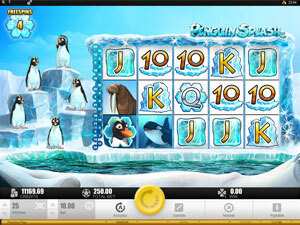 This time the feathery Microgaming divers from Penguin Splash slot machine are really worthy of the Olympic Games. So, you just can't miss such a grandiose no download event that will take place on 5 reels. But most of the money-making spectator seats are already occupied. That's why, you'll have to go around the OVERsized natural pool with 25 paylines. So that to find the best one for you to watch every contestant clearly during the main spinning race or when up to 25 Free Spins are acclaimed. By the way... In addition to the resounding WET-through VICTORY, the champion will gain the highest glorious jackpot of $200,000! And out of CASH joy, it will share this colossal trophy with you giving you one more chance to multiply your prizes at the Gamble Feature as well! EVER gambling FROST of the South Pole makes the local referees stay COOL-headed and fair. That's why, they are impossible to be bribed when you play for real with the bets from $0.25 and up to $250. However, these stakes can be better used to cheer up the flightless SPORTsmen always willing to catch the following coins: $0.01, $0.02, $0.05, $0.10, $0.20, $0.25, $0.50, $1.00, $2.00, $5.00 and $10.00. But the moment the judging panel emerges from underwater, all the yelling and screaming from the grandstand should be stopped. Cause the swimming officials intend to inform about something of HIGH importance every time. So, wait until 5 supreme Whales come to the top stake surface and hand the most triumphant jackpot of 20,000 coins or $200,000 over to... YOU! Oh, yippee! While training hard, the winged divers have to gorge themselves on some Fish. Fresh and WILDly full of vitamins... They are treated as the most delicious and healthy food that may jump right into the open beaks. So that to bring the dozens of winning combinations in case of substituting any other chilling images apart from the scatter symbols. Hey, it's also really easy to become FISH-addicted and overeat. But is it possible to compete with others on a full stomach? Definitely, not! That's why, don't let the good-humored creatures carry things too far and... Keep an eye on their proper daily menu that should consist of several Fish only enough for them to feel active and ready to cover looong distances within the shortest period of time! Shifting from foot to foot, some Penguins are visibly bored. To boost their scattered spirits, just spin non-stop and... These winter lovers will follow you closely to see all your thrilling rewards firsthand. Oh, how curious they are! 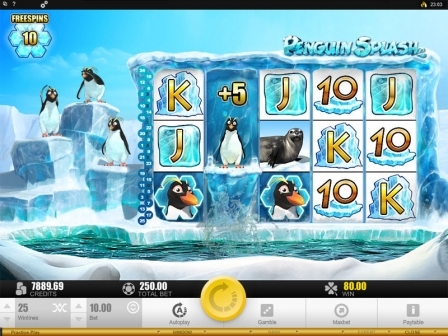 Besides, at least 3 Penguins gathered in a scattered crowd will make a lucrative fuss leading you to the Bonus Feature with up to 25 Free Spins. Great stuff, isn't it? 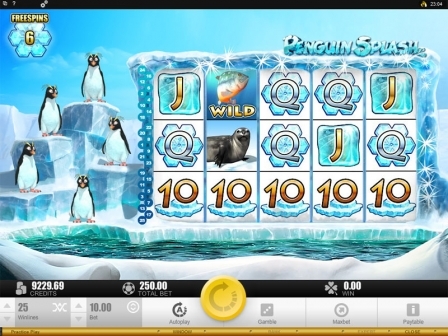 So, just enjoy them to your heart's content during this feature whereas the tailed fidgets bend over backwards to achieve a spinning TRIUMPH at the competitions and... Take a well-deserved rest with lots of delightful prize moments at Penguin Vacation slot machine! 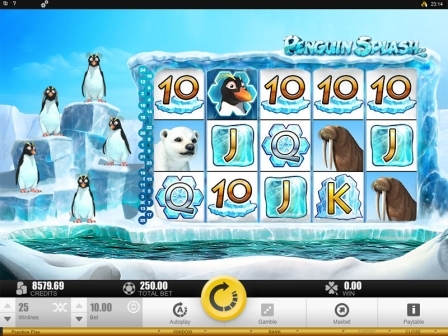 Well, as soon as 3 or more Penguins come in view at once and start messing around, you'll seize hold of up to 25 Free Spins. So that to give a look at their PROFITable water plunging. Are there 2 of them staying on the floe field? 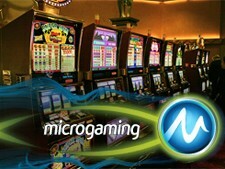 Then, you can easily double all your trophies received within Free Spins. Hey! Break the winning ICE at the Gamble Feature on top of that! Here you are invited into the glacial card zone to choose the red or black color of the concealed card and... Increase your bonus reward by 2 times if you're right. Don't stop at one correct pick, ok? 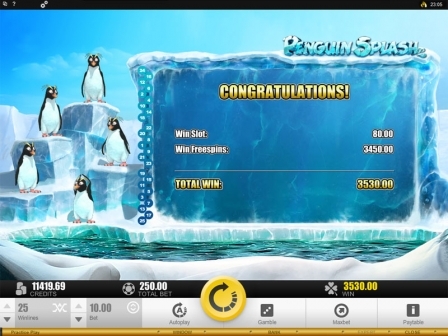 Yeah, every sporty bird DEEPly desires to pull out a championship and... Get on the victory frozen podium finally during Penguin Splash slots! Watch out for your favorites there and play for real cash at the same time. To rejoice at their success together with the outstanding features and presents into the bargain!